16 velocity-sensitive trigger pads (wich illuminate as they are played !!!). An X-Y touch pad based on Korg's KAOSS Pad technology. Two knobs freely assignable to Midi CC. the Korg padKONTROL can be powered using USB bus power or an optional 9-Volt adapter. 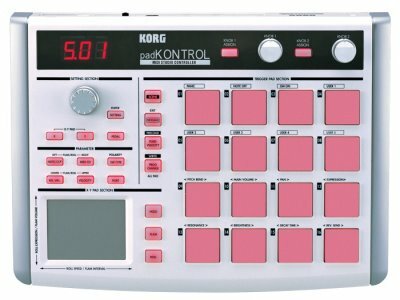 The Korg padKONTROL is available February 2006 with a U.S. MSRP of $299. You know the M-audio Trigger finger : A controller with 16 sensitive pads devoted to live and rithmic play. But in medicine a trigger finger is "a common problem that causes pain and catching. Tendons that help bend the fingers and thumb slide through a snug tunnel. Irritation as the tendons slip into the tunnel can cause the opening of the tunnel to become smaller, or the tendon to thicken so that it can't easily pass through the tunnel. As you try to straighten the finger, the tendon becomes momentarily stuck at the mouth of the tunnel then pops as the tendon slips past the tight area. This can cause pain and catching as you try to move the finger." Very annoying for a drummer....and for a marketing director. the Presonus is a desktop USB/MIDI controller for DAW. It gets a unique motorized fader to control the DAW and classic transport buttons. A footswitch jack is also included for hands-free punch in/out during recording. 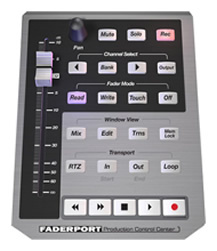 The FaderPort works with any Mac or Windows based recording software including Pro Tools, Cubase, Nuendo, SONAR, Digital Performer and more. Line 6 announced today the availability of ToneCore® effect modules and ToneDock mono and stereo stompboxes. Users now have the ability to swap out the module inside a ToneCore pedal with any module from the entire line including Uber Metal™, Echo Park™, Crunchtone™, Space Chorus™, Tap Tremolo™, Constrictor™, Dr. Distorto™, Verbzilla™, Liqua Flange™, Roto-Machine™, and Otto Filter™. The MINOD® VORGA filter is supposed to be the backbone of its original sound. It has two modes set by a switch: 24dB Low pass (4-pole) or 12dB Band pass (2x2-pole) with variable width, where both ends are 2-pole or 12dB/oct. The cutoff frequency and bandwidth can be varied independently. What makes the filter unique is the two resonance peaks, one on each side of the band pass filter. This creates timbres not available on traditional analog synths. The drive control helps too. The built in sequencer works like an analog sequencer. The sequence can be transposed by an external MIDI keyboard, the internal keys or using the joystick. The VORGA can store sixteen sound patches and sixteen sequence patterns. It also supports SYSEX messages to upload or download patches and sequences. 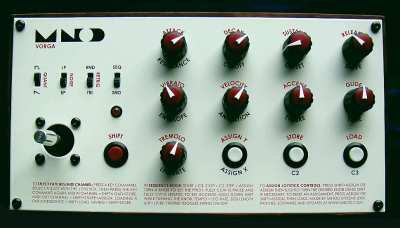 The VORGA has nine knobs and four switches.All controls sends MIDI messages, so the MINOD® VORGA can be used as a MIDI controller as well. The firmware can also be upgraded via MIDI as bug fixes and new features comes along. Dimensions are 26x14x8 cm (w/d/h). Pricing : 640€ plus shipping. DC adaptor not included. Technorient is the home of the great Technasia project (Amil Khan & Charles Siegling) and distibutor of Sino, Static Drum, Green (Joris Voorn), Ethique (John Thomas), Star Tracks, The Steppin' Show, Bassball, and Minimaxima labels. Born 12 September 1962, Detroit, Michigan, USA. Juan Atkins attended Belleville High School until 1980, where he met Derrick May and Kevin Saunderson, his future compatriots in the revolutionising of techno. He acquired his love of dance music listening to the various mix shows on the radio, and in particular those of the Detroit DJ The Electrifyin' Mojo. Inspired by the emergence of synthesizer technology, Atkins first came to prominence in the early 80s with Cybotron, an electro outfit he formed with Rick Davis. The duo achieved some success, most notably with the 1982 track "Clear", which established the basic sound of what would later be termed techno. Branching out from Cybotron, Atkins concentrated on Deep Space Soundworks, a music collective he had formed with May and Saunderson in 1981. The three men also founded Detroit's Music Institute, which quickly became the focal point for the city's underground club movement. From 1985 Atkins started working solo as Model 500, releasing polished, minimalist, hi-tech gems such as "No UFO's", "The Chase" and "Night Drive" on his own Metroplex label (home to the first releases by many of the Detroit stars), which were pivotal in the development of techno (most of these were later reissued on Belgian label R&S Records' Classics compilation). Juan Atkins' reputation took off in the late 80s, when the new Detroit dance movement reached the shores of Europe, and was frequently invited to remix tracks for artists as diverse as Inner City, Coldcut, Fine Young Cannibals, Seal and the Style Council. During the exploitative early 90s Juan remained justifiably aloof, with his own artistic output somewhat limited, although during this period he continued to work in conjunction with Mike Banks and Underground Resistance, helping to produce such classics as Underground Resistance's Galaxy 2 Galaxy and the excellent Red Planet series of releases. In 1992, he reopened his Metroplex label, and when Model 500 signed to R&S, releases such as Classics and the brilliant EP Sonic Sunset received the attention they deserved. With the album Deep Space, Juan Atkins treated a new generation of dance enthusiasts to his typically highly crafted compositions. A second compilation of his early 90s, Metroplex-based work under the name Infiniti was released by the German label Tresor Records. Although at times sounding formulaic, the compilation did include "Game One' (produced with Orlando Voorn), one of Atkins" most memorable records, capturing his classically minimal yet warm style. In a prolific period between 1998 and 1999, he recorded new Infiniti and Model 500 albums and the US label Wax Trax! released a mix album. His last news is a nomination for a Grammy as a writer in part for the song "Lose Control" by Missy Elliot (with a sample from "Clear"). Here, some infos about that. The new Edirol R-09 is building on the success of the R-1. It takes many of the most desired features — 24-bit uncompressed recording and a built-in stereo mic — and shrinks it all down into a more streamlined, stylish, and affordable package. Capture source material at a crystal-clean 24-bit resolution with your choice of 44.1 or 48kHz sample rates. You can record and play back in MP3 format as well (up to 320kbps). Once recorded, your files can be monitored through the R-09’s headphone jack and/or exported to a computer via USB.